Influencer marketing is a hot topic, but actually implementing and optimizing these programs can be intimidating for most marketers. The intimidation makes sense. While word-of-mouth marketing has been central to marketing for years, the wave of influencer marketing has raised questions on how to best work with, motivate, and leverage influencers. 65% of brands already have an influencer program and most of these are new programs. Learning all the nuances can be a tricky and time-consuming feat, especially if your marketing team is already running near full capacity. 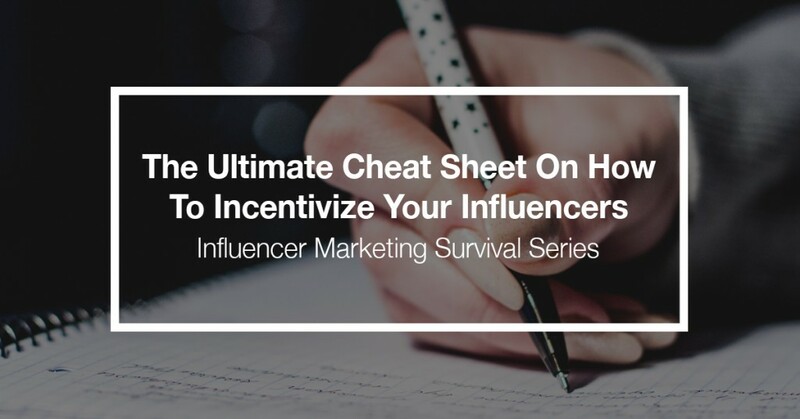 To help you stay ahead of the curve, we’ve put together a handy cheat sheet on how to best incentivize influencers. Incentivizing Influencers: Do you pay them? Is that even the right question? Should you pay your influencers? The short answer is ‘not necessarily.’ This is one of the biggest misconceptions about influencers and brand ambassadors. The better question is “Should you incentivize or compensate your influencers and ambassadors?”. That answer is most definitely ‘yes.’ Most influencers do want to be compensated but many times cash is not necessary or even the best option for incentivizing them. While there are influencers that will only talk about your brand if you pay them (and companies that will take your money to match you to them), that’s called advertising and they may be promoting your competitor next week. True influencer marketing is built upon an authentic relationship with your brand — it’s like organic marketing on steroids. The best influencers for your brand are people who use and love your products, not just advertisers with an audience. Enter your top influencers into a giveaway: No matter the type of campaign you’re running, your influencers help you promote it. Entering the influencers that drive the most results into a giveaway can be a great way to reward them and make it fun. Send them pre-launch product samples: If you’re able to track the influencers that have been active with your brand before, sending them a pre-launch sample or setting aside some inventory for them is an easy way to thank them for being a loyal fan and helping tell the story. Plus, you get to take credit for retail value while paying wholesale cost. For an example of this, read our case study with Coca-Cola. Sponsor them to attend a conference or event: Is there an industry event your influencers would like to go to? Giving them passes to an event and/or covering the travel expenses for some of your top influencers is not only a great incentive, but it also gives them an incredible brand experience to talk about. If you have discounted or free passes, even better for your budget. Discounts on products or services: This one may not directly impact your budget and can be a great loyalty perk for your Long Tail influencers. In the past, many brands would verify a possible influencer’s credentials and then move them to a list where they pretty much had discounts for life. Today you can actually track the ROI of your influencers and offer discounts only to those active influencers. Pay influencers directly: While most brands quickly learn that paying influencers to talk about them is really like trying to “rent authenticity,” it can be useful for driving short-term waves of traffic. If you’re one of the brands that has a celebrity that is a genuine fan of your brand, you’re in a special category and this can be a useful tactic for rewarding them. Social (public) recognition: Your everyday influencers are already uber fans of your brand, so thank those that drive the most user-submitted photos, recipe downloads or anything else you’re tracking in your campaigns. Sideqik’s influencer dashboards make this easy and more fun for your influencers. Status within the community: This can be a big one. Simply calling them ambassadors or coming up with a group name for your everyday influencer can be a huge reward. We’ve seen this in the outdoor sporting industry for years as they’d accept people as “Pro Staff” and with various sporting related companies that created their own “Team ______”. Access channel for exclusive content or deals: Do you have any valuable or exclusive content? Release it through your influencers. It could be anything from recipes if you’re a nutrition company, to behind the scenes footage if you’re an entertainment brand or in-game content or beta codes if you’re a game publisher. Not only does this highlight your influencers, but it also helps your content go viral. Access to behind the scenes experience at store, conference or event: Everyone loves exclusive access. With a little creativity, every brand has dozens of these possibilities available to them. One marketer we know, simply sectioned off a private section for their influencers at a big event and provided some light snacks and sodas. It was a HUGE hit with their influencers and helped them connect online personalities with real-world people. Preferential treatment: This one depends on your brand but can you upgrade their shipping, list them at an event, etc. There are lots of options for everyone from e-commerce companies to consumer brands. Appearance in brand videos: If your brand frequently uses videos in your marketing, think about how you can bring your influencers into them. One of our customers found that their everyday influencers were better at making walkthrough and help videos than their staff. Access to tools and technology they wouldn’t otherwise have access to: Does your company make tools or technology that would benefit your influencers? One of the benefits for Sideqik customers is the ability to give influencers access to some of our analytics and influencer tools. Help to grow their own audience and/or their influence: It’s a social world. While not everyone is watching how many people follow them on Twitter, Youtube, Twitch, Instagram, etc., some people are active community builders. We’ve seen many companies incentivize their influencers by helping them grow their individual followings and communities. The bonus is that as they become more influential that they help more people know about your brand. Swag: Who doesn’t love swag? Know who your best influencers were for the last campaign, over the last month, or the last year? Send them some a shirt, some stickers or anything. It’s another place where creativity can be fun. We’ve seen several brands do small run batches of swag exclusively for different types of influencers. We all like to be part of something bigger. Think about what’s in it for your influencers and what they’re trying to accomplish. An influencer that feels like they can engage with a special opportunity will be more likely to be loyal and drive bigger results for your brand. Ultimately, influencer marketing is a form of earned media (i.e. media that a company earns when individuals become part of the marketing channel). There are some costs associated with building an influencer program but they’re small when compared to the massive return. Small investments in identifying your Long Tail influencers and growing your influencer marketing program will pay big dividends in the months and years to come. What other ways have you seen to incentivize influencers? What are your favorites? I know this is like asking a fisherman where their favorite “spot” is but we all grow when we help each other out.